"The following file(s) have been blocked by the administrator"
This is because: The user tried uploading .OCX files, which were in the blocked file type. Here is what I did to allow the OCX files. 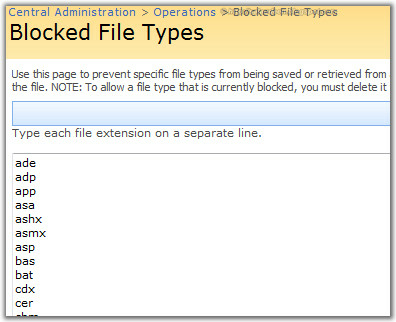 Blocked File types option in SharePoint is a great security/governance feature. You don't want your users to upload executable or Movie files to SharePoint libraries, Isn't it? Find a section named "Security Configuration". Under this section, you can find a link for "Blocked file types". You will now have a large list showing all of the blocked file extensions, allowing you to add and remove them from the list. In this case you want to allow OCX files so they could shared through SharePoint, Just Remove the file type OCX and click "OK". 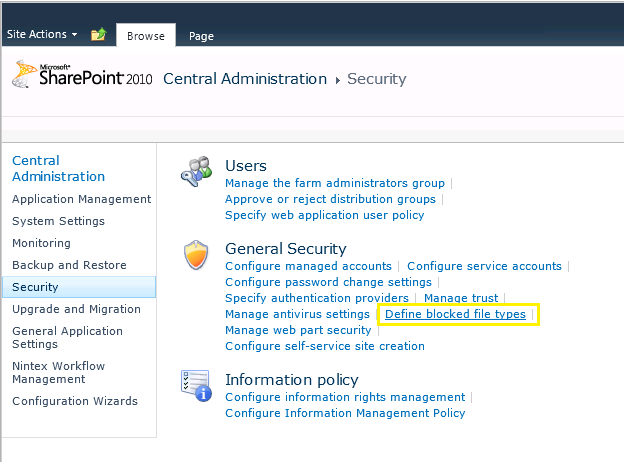 For SharePoint 2010, You can navigate to: Central Adminstration >> Security >> Define blocked file types. Is SharePoint blocking Files Based on File Extension or actual file type? Remember, SharePoint blocks file based on its extensions and not by the actual file type. Which means, You can rename the blocked file type (E.g. Rename "Program.exe" to "Program.txt") and still upload them to SharePoint. To mitigate, you need to have Forefront Security for SharePoint, which can block files based on its type and not just extension. Blocked file types Central are configured in Central Administration, are applied per web application, not globally throughout your farm. 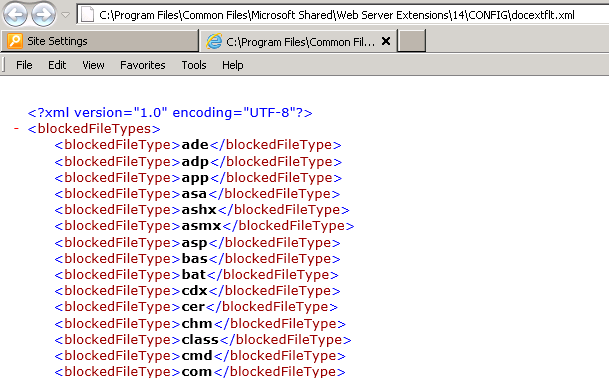 Internally, SharePoint keeps a file in 14 hive (or 12 hive in MOSS 2007) Config folder docextflt.xml So, When you create a new web application, blocked files list getting populated from this xml file. However changing this file will not affect any existing web applications created already. But this will impact the default blocked files list, when you create a new web application. Manage SharePoint blocked file types with PowerShell. Write-host "Enter the Web Application URL:"
write-host "DLG File type has been Blocked"
write-host "Blocked File type DLG has been Removed"